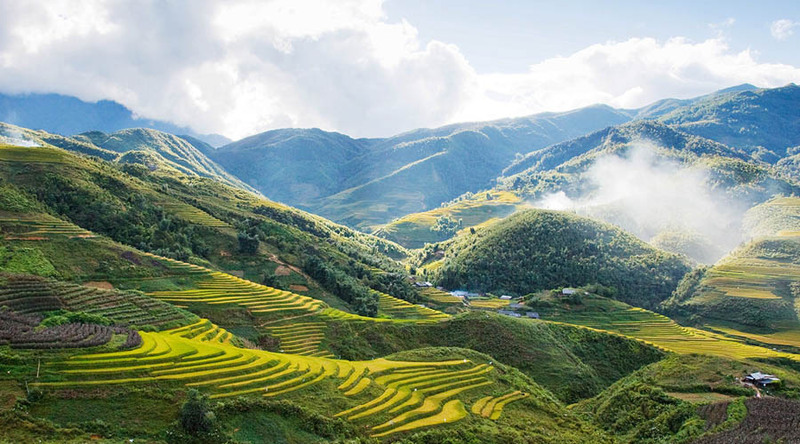 6h45 – 7h15: Our bus and tourguide will pick you up at the meeting point then depart to Sapa, following Noi Bai – Lao Cai high-way. Along the way, you will have chance to contemplate the beauty of northwest mountains that terraced fields are sparkling in sunlight or dim in thick fog. Have a short break in 30 minutes then continue the trip to Sapa. 13h00: Arrive in Sapa, check in hotel, have lunch. 14h30: You start trekking to Cat Cat village which is occupied by the Black H’mong tribe. Here, you can see the hydroelectric power station which was built by the French in twentieth century. You will experience the tribal way of life of ethnic minorities while enjoying wonderful views of the terraced rice paddy fields and the waterfall in Cat Cat village. Evening: After dinner, you are free to explore the charm of Sapa by night, enjoy roasted corn, baked eggs beside charcoal fire or go shopping. Overnight at hotel in Sapa. After breakfast, the tourist will visit Lao Chai – Ta Van Village to understand more about ethnic minority communitie, enjoy imposing mountain scenery, terraced fields, marvellous nature. Visit ancient sacred stones with big – small ones which have many unique images, secret sigh. You have lunch in Lao Chai. 13h30: The bus will pick you up at Ta Van come back to Sapa Town. 16h00: It‘s time to say “Good bye Sapa!” and drive back to Hanoi. Along the way, once again you have a chance to enjoy the magical beauty of northwest mountains. 21h00: We arrive in Ha Noi. End of services – see you next time!